(2012) The Woman who Died a Lot. (2005) The Big Over Easy . The Woman who Died a Lot ( 2012) is one of Jasper Fforde's best. I've spent most of my life confused ... You get used to it after a while. There's a lot to be said about merely having a hazy idea of what's going on but generally reaching the right outcome by following broad policy outlines. ... Once the horror and unpredictability of unintended consequences gets a hold, even the best-intentioned and noblest of plans generally descend to mayhem, confusion, and despair. Luckily for the librarian who fired the shot, the potential thief had fallen within the library boundary, allowing the killing to be categorized as "Justifiable Lethal Force by a State-Registered Librarian in the Course of His or Her Duties," a misdemeanor that required only a few forms to be filled in. As it says on the T-shirts, I DON'T SCARE EASILY — I'M A LIBRARIAN. wishful thinking and being easily distracted are powerful evolutionary tools. I'd also like to thank the Van Allen belts for protecting us from the harmful solar wind, and the earth for being just the right distance from the sun to be conducive to life, and for the ability of water atoms to clump so efficiently, for pretty much the same reason. Finally, I'd like to thank every single one of my forebears for surviving long enough in this hostile world to procreate. Without any one of you, this book would not have been possible. Lastly a mention that the book is about Smiting, Smitees, and Smite-deflectors — all timely in the modern smite-worthy world. 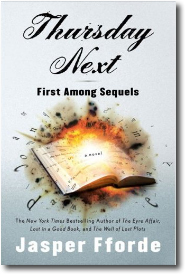 Thursday Next in First Among Sequels ( 2007) is Jasper Fforde's best yet. Fforde is a master satirist with the quickest of pens. In this book, the protagonist is Thursday Next. The plot concerns saving the world. The McGuffin is the recipe for unscrambling eggs. I appreciate Fforde's depth of imagination, his heartfelt defense of the art of reading, and the cleverness of this series' central conceit. There are too many plotlines, and the exposition of how the Bookworld operates too often slams the brakes on the narrative ... almost every other character [than the protagonist] exists only to deliver punch lines and clever asides. ... [high] wheat-to-chaff ratio. Concerning Berry's compliant about plotlines, Fforde has multiple plotlines because they are interesting and relevant (sometimes for the plot, sometimes for social commentary, often for both). The complexity that daunts Barry seems much more like real life (where one juggles making supper with averting the end-of-the-world, solving work problems, and mentoring a juvenile) than a stripped-down minimalist plot. "normal" middle-class family life in "a central position in southern England" in a town with "the only radio station in England dedicated solely to mariachi music" [p. 1]. "Jurisfiction ... the policing agency within books. Working with the intelligence-gathering capabilities of Text Grand Central, the Prose Resource Operatives at Jurisfiction work tirelessly to maintain the continuity of the narrative within the pages of all the books ever written, a sometimes thankless task. Jurisfiction agents live mostly on their wits as they attempt to reconcile the author's original wishes and the reader's expectations against a strict and largely pointless set of bureaucratic guidelines laid down by the Council of Genres." [p. 35]. Concerning Berry's compliant about characters, Fforde in fact slips only once: Isambard Kingdom Bruñel generates a word vocabulary that has feeble echoes of Roald Dahl, but ends up sounding stupid. Thankfully this painfulness is caged into Chapter 11. Meanwhile all the other characters, especially Friday's other selves and her family members, are necessary and contribute. We can only praise a Bookworld that has a Mispeling Vyrus Farst Respons Groop. And an "Anti-Smite shield, designed to protect mankind (or Britain at the very least) from an over-zealous deity eager to cleanse the population of sin" [p. 261]. "It's not like the books where everything's laid out and orderly. The oral tradition is dynamic like you've no idea. Change anything in there and you will, quite literally give the narrator ... a brain hemorrhage. The same can be said of Poetry. You don't want to go hacking around in there without a clear head on your shoulders." "It's like a big emotion magnifier. All feelings are exacerbated to a dangerous level. You can find things out about yourself that you never knew--or never wanted to know. We have a saying: 'You can lose yourself in a book, but you find yourself in Poetry.' It's like being able to see yourself when drunk." [p. 49]. "Rescue seemed a very remote possibility, and that was at the nub of the whole ethical-dilemma argument. You never come out on top no matter what. The only way to win the game is not to play." [p. 303]. But how does it turn out? Read the Book! The Fourth Bear: a Nursery Crime (2006) by Jasper Fforde. Really good, especially for those of us that have run out of Douglas Adams and Terry Pratchett. A fantasy plot that writhes and ripples and reinvents itself in each chapter. Punch and Judy (of the Show) as marriage counselors are particularly effective. You'd be surprised by the number of people who die in Obscurity. "McGuffin, flitting around with his Men in Green, in the background, was changing, crossbreeding, bioengineering and reseeding until he had created a devastatingly destructive power that could be created in a grow bag with nothing more complex than a dibbler and a watering can." "Right," growled Jack. "Cuclear energy." is the prototype of Project Ginja Assassin, a bioculinary weapons technology ... impervious to pity, guilt or scruples, as the advance guard of an army on the move ... agile, adaptable, tireless and highly motivated -- the perfect Ginja. This one almost reaches the brilliance of his Thursday Next books.